Otoplasty, (ear pinning surgery), corrects the appearance of prominent ears by improving the shape and size of the ear and the angle between the ear and your head. 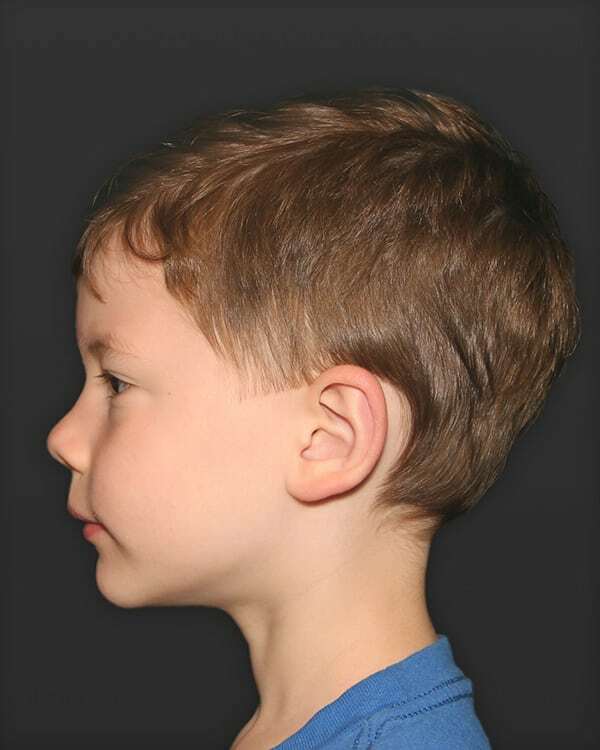 Ear prominence may be present at birth, develop as a child grows, or be due to an injury later in life. Several studies have demonstrated that undergoing an otoplasty will lead to improved self-esteem and decreased anxiety. I am always thrilled when I receive letters from parents excited about the changes they witness in their children post-surgery. They explain that their child is more social, out-going, athletic and often performing better academically…The child is more confident. The history of otoplasty dates back to 1845 when horsehair was used instead of modern day nylon sutures. The technique has evolved considerably and now is considered a routine outpatient procedure. Ear development begins during the fifth and sixth weeks of gestation. The body forms six swellings called hillocks around the brachial groove which will eventually convalesce to form the external ear and the ear canal respectively. If a small piece breaks off from the hillock during this process, you may develop an accessory tragus or skin tag. If the process runs smoothly, the external ear will develop into a series of convexities and concavities. Detailed in the diagram, the outer rim of the ear is called the helix, inner rim, the antihelix, and deep bowl, the concha. The innermost aspect of the external ear is called the tragus. Usually, a prominent ear is secondary to three factors: a missing fold (under-developed antihelix), an enlarged conchal bowl, and an obtuse angle between the ear and the scalp. A prominent ear may also have a prominent lobule. Precise recognition of the specific defects causing a prominent ear is paramount and will dictate surgical technique. 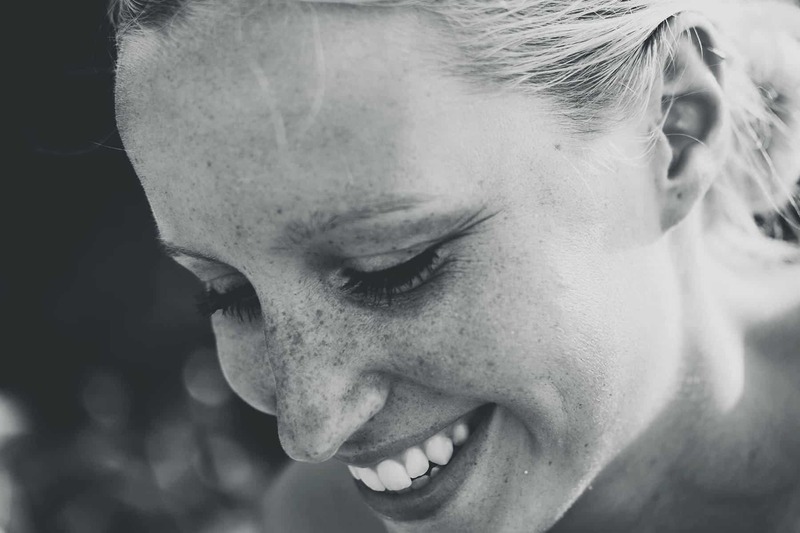 A successful otoplasty addresses each of these areas when necessary. The goal of otoplasty is to set back your ears in a symmetric manner. It is essential that they are not overly corrected. 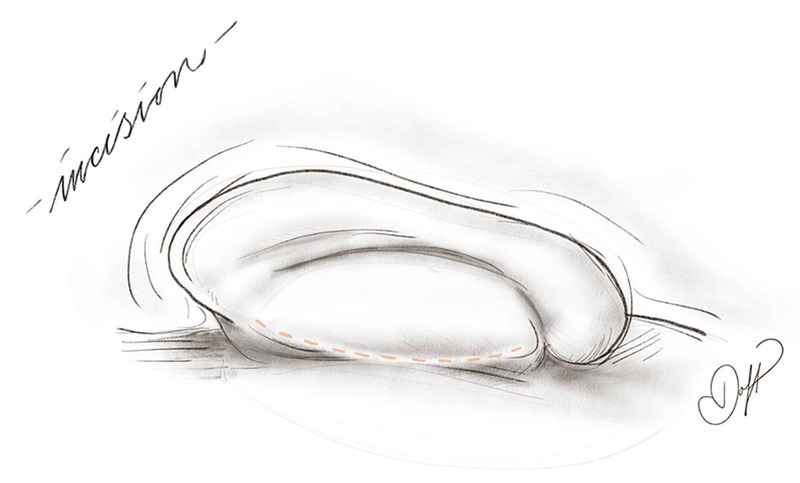 It is also important that the new antihelix or crease has a smooth and natural contour. Surgery can also be helpful for a “lop ear,” “cup ear,” over-sized ear, as well as large or stretched earlobes. When a newborn infant is identified as having a prominent ear, it is possible to alter the shape of the ear forever through a molding technique. Infants are born with high levels of estrogen in their bloodstreams, which peaks at day three of life and returns to baseline at six weeks. This elevated estrogen increases the ear cartilage’s plasticity, creating a privileged period during which the ear can be molded into the correct position. Sometimes the molding period can be extended when mothers are breastfeeding or babies are born prematurely. For more information on ear molding please refer to The Newborn Butterfly Project. The surgery is an outpatient procedure performed in an ambulatory surgical center. Depending on the extent of surgery, adult patients may have the procedure performed in the office under local anesthesia. 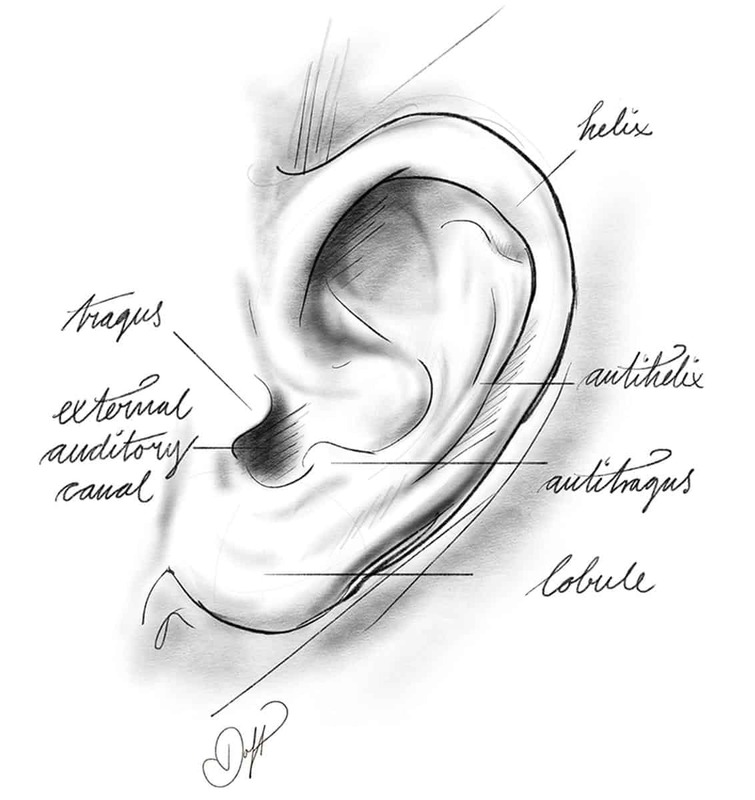 The surgery begins by making an incision in the crease between your ear and your scalp to reveal cartilage (see sketch). The posterior incision is well hidden even when wearing a ponytail or short hair. Through this incision, the entire operation is performed, making it rare to have a scar on the visible surface of your ear. Initially, attention is placed on the antihelical fold, the Y-shaped fold that runs vertically in the center of your ear. Often in prominent ears, this fold is flattened or underdeveloped. 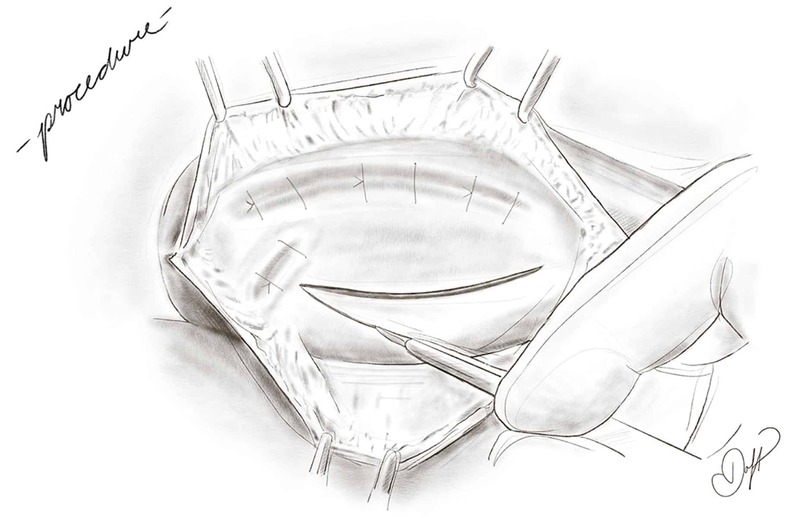 Using the Mustarde technique, a new fold is formed by tightening permanent sutures so that the ear is recontoured into the correct anatomical shape. An incision is hidden in the crease between your ear and your scalp. Through this incision, the entire operation is performed. Next, a piece of the concha is often removed, moving the ear closer to the scalp. Sutures are then placed behind your ear to decrease the angle between your scalp and ear. Lastly, the incision is closed with dissolving stitches so that they do not need to be removed afterward. I often inject a new medication called Exparel into the incision. Exparel is a slow releasing local anesthetic which works for three days, decreasing the need for narcotic use. A large bandage is then placed to protect your new ears. Depicted are two key steps in reducing a prominent ear. An antihelical fold, the Y-shaped crease in the center of your ear, needs to be defined or created. The fold is delineated by tightening permanent sutures. Second, a piece of the concha or bowl of the ear is removed to reduce ear prominence. Often patients ask me about a small bump on the inside of their upper ear. The extra tissue can exaggerate an already prominent ear. The triangular prominence or “Darwin’s tubercle,” is formed from extra skin and a small sliver of cartilage. Charles Darwin originally mentioned the term in his book The Descent of Man (1879) to illustrate basic genetics. His theory states that having a Darwin’s tubercle is a dominant trait controlled by a single gene. Twin studies later demonstrated that this was not true. Although it is a normal anatomical variant, it is easy to remove if you do not like it’s appearance. 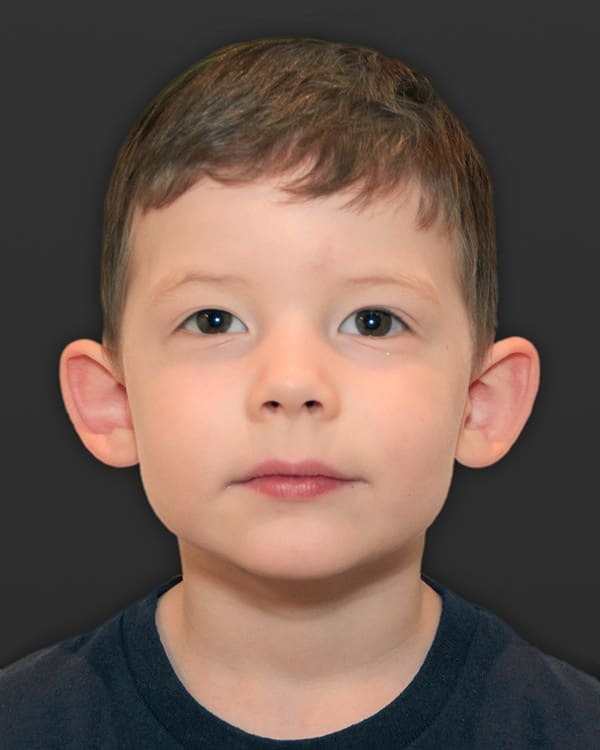 I find that there are three different ages when patients seek otoplasty: a child prior to entering kindergarten, a teenager who has been teased and is self-conscious about their appearance, and an adult. 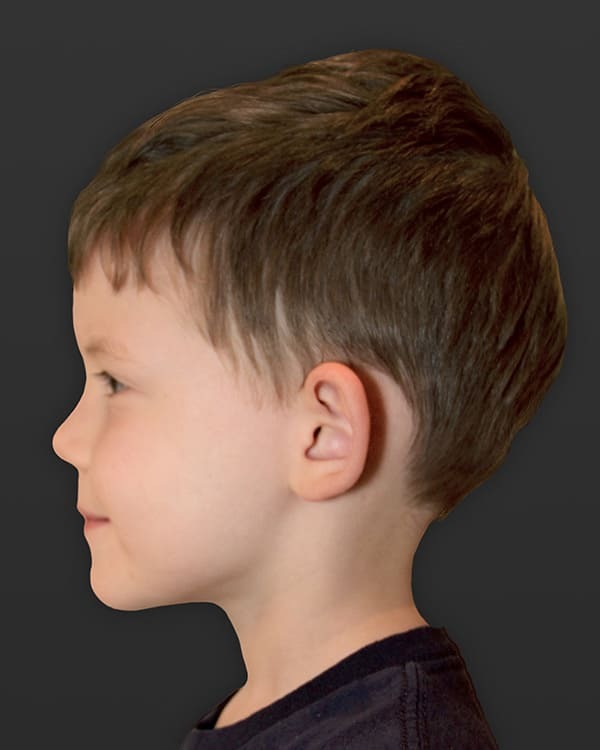 About 85% of ear growth is achieved by five years old. Therefore, any surgical intervention which may affect growth should be performed after the child is age five. A child’s ear is softer than the ear of an adult, making it easier to shape. Psychologically, age five is also a significant time during development as it is before teasing and bullying occur in school. 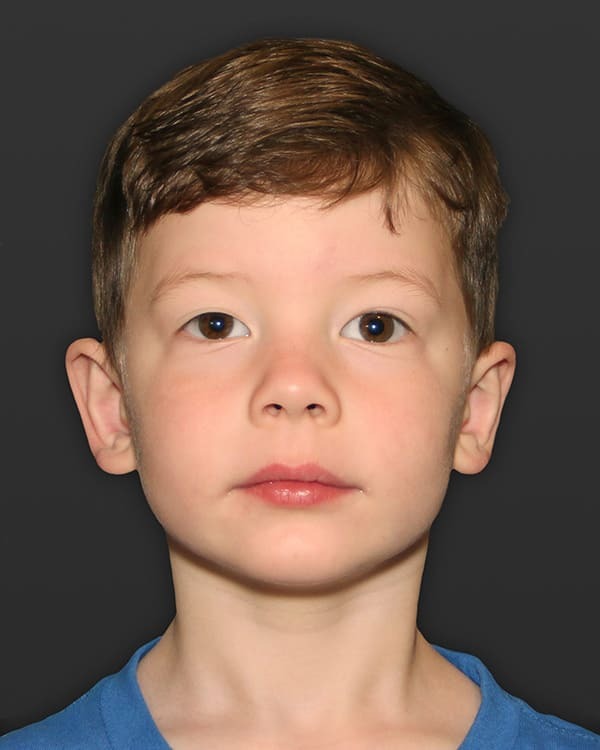 Many of my patients elect to have their children undergo otoplasty during the summer before kindergarten. Others will wait to see if the deformity bothers their child and allow the child to bring up the subject. At whatever age, otoplasty is a very empowering procedure. Although many patients present to my office due to congenital deformities, there are also patients who have acquired ear deformities. Ear reconstruction may be secondary to loss of skin and cartilage due to animal bites, car accidents, sports injuries, burns, or skin cancer operations. In these cases, it is important that the wound is stable and if due to skin cancer, that the borders of the resection are negative, prior to reconstruction. Otoplasty may be performed in a hospital or an outpatient surgery center. General anesthesia is recommended for young patients, while local anesthesia and intravenous sedation are used for young adults and adults. The procedure lasts for two hours. A bandage is wrapped around the head to ensure the new positioning of the ear for three to five days. Once the bandages are removed you will wear a headband for one month during the day and night and then for two additional months at night. Many patients do not complain of pain after the first two days. Adults often return to work in five days and children return to school in seven days. 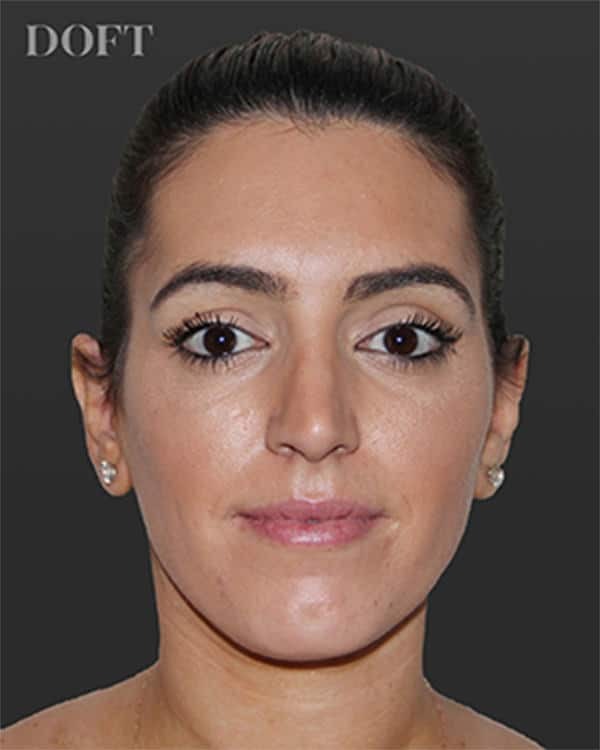 The results from an otoplasty are long-lasting. Unfortunately, cartilage does have a memory; if the permanent sutures which are supporting the repair become undone, a revision may be necessary. Often it is possible to perform the revision under local anesthesia in the office. 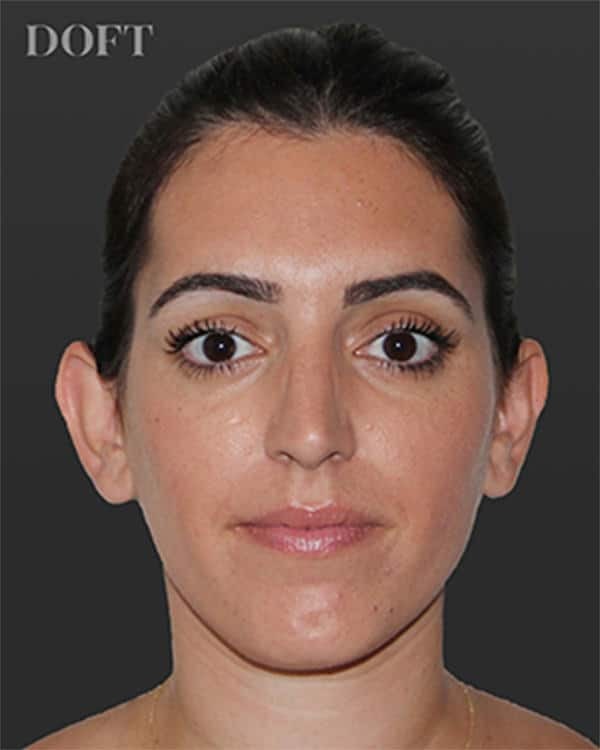 If you are considering otoplasty surgery, please call our office at (212) 600.4109 to arrange for a consultation. Our New York City practice accommodates out of town and international patients who need to travel in for surgery as well as those who are local to Manhattan.